Great Chicken that will make you crave for more. In a large bowl, whisk together the first 8 ingredients (water, Teriyaki sauce, lime, garlic, Tequila, liquid smoke, salt, and ground ginger), coat chicken in mixture, and marinade for at least 2 hours or overnight. In another large bowl whisk together the next 9 ingredients(mayonnaise, sour cream, spicy salsa, milk, Cajun spice, parsley, hot sauce, dill weed, and cumin), cover, and chill until needed. 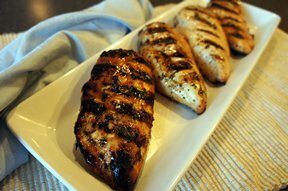 Grill the marinated chicken breasts for 3-5 minutes per side, or until cooked through. Discard leftover marinade. 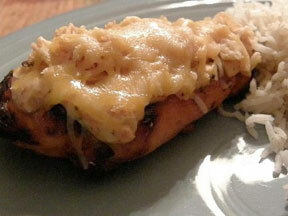 Brush grilled chicken with reserved dressing, sprinkle with cheese, and broil until cheese has melted. "awsome chicken! one of my favorite recipes."